The Swiss franc shock and the negative interest rates have accelerated a development that had already emerged on the Swiss real estate market prior to the abandonment of the EUR/CHF minimum exchange rate. 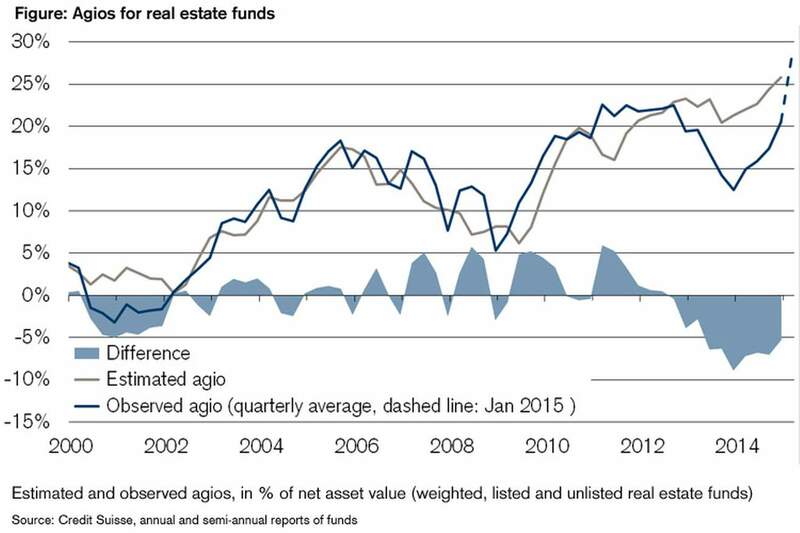 The strong inflow of capital is accelerating the trend towards an oversupply. The traditional real estate cycle is returning. The abandonment of the EUR/CHF minimum exchange rate and associated Swiss franc shock will not spare the Swiss real estate market. For the time being, however, the negative interest rates introduced on a broad front by the Swiss National Bank (SNB) in January have significantly enhanced the attractiveness of real estate returns. The zero interest of long-term, low-risk investments such as ten-year Swiss government bonds and the fear of negative interest rates are driving investors into the real estate market and causing prices to rise because there are barely any alternatives with similarly favorable risk/return ratios. However, this inflow of capital also has its downsides as it is accelerating the trend towards an oversupply. The traditional real estate cycle in which excess supply ultimately replaces the long phase of rising prices and that was barely perceptible in the long boom phase of the real estate market is returning. This is all the more so in view of the fact that second-round effects of the Swiss franc shock will exert a negative impact on property demand. The introduction of negative interest rates has consequences for the investment strategy of private and above all institutional investors. Safe government bonds are barely yielding any more positive returns and liquid assets are at threat of being impaired by negative interest rates. Against this backdrop, real estate investments are a sought-after substitute. Following the renewed interest rate cut by the Swiss National Bank, the yield spreads of real estate investments versus low-risk investments have climbed to record levels. The fear of negative interest rates and the lack of alternatives are prompting investors to put aside the caution partially exercised beforehand towards real estate investments, especially since neither sharp interest rate hikes nor an excessive slump in demand are to be expected in the next few quarters. This can be clearly seen from the fact that in January the gap between the premiums forecast and those actually observed for indirect real estate investments closed within a very short space of time due to the strong demand from investors (see Figure). The prices for direct real estate investments should continue to rise in the current negative interest environment and returns conversely fall regardless of the trend to excess supply and declining yields. This will be accompanied by an increasing decoupling of property prices from their underlying net values. The expected downturn in the demand for space due to the Swiss franc shock comes at an inopportune time for the office property market. Despite solid economic growth over four years (2011–2014) ranging from 1 percent to 2 percent, an oversupply of office space has built up in Zurich and Geneva in particular and amounts to over 1 million m² nationwide. 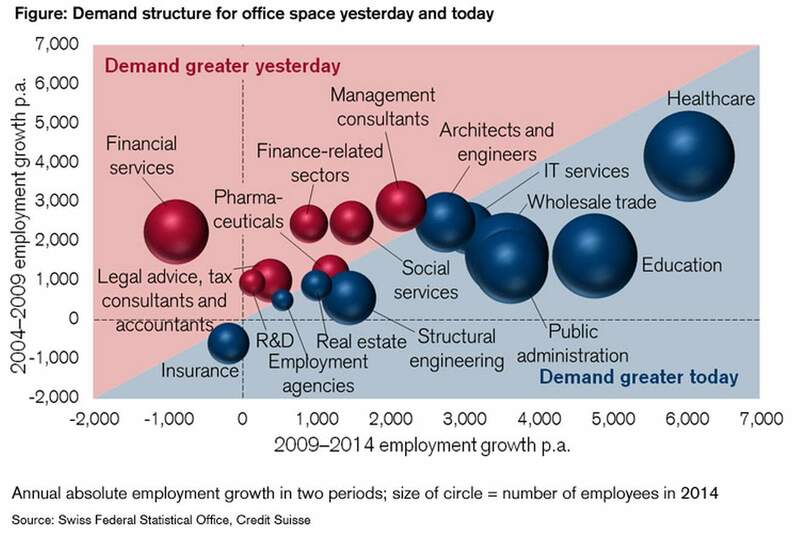 The main reason for this is that the demand for space after 2009 was particularly shaped by domestic sectors such as healthcare, education and public administration with lower space requirements and willingness to pay (see Figure). Because for a long time the absorption of new construction projects ran smoothly, the market did not react quickly enough to the changed demand requirements. The result is an oversupply that varies very widely in local terms. Prime locations e.g. near railway stations in the major centers are still holding up well. However, expensive central locations and locations outside the central business district that are less well connected are coming under pressure. 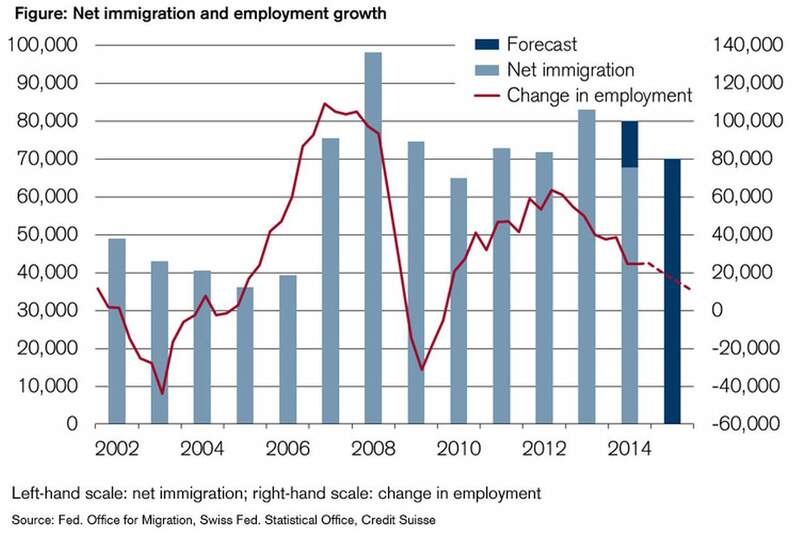 Vacancies here can be expected to accumulate further and the oversupply become even larger in the future as although the peak of construction output has already been passed, construction activity remains at a very high level owing to the investment crisis that has exacerbated even further with the introduction of negative interest rates. Altogether this market development will culminate in an accelerated rise in vacancies and even more pressure on office rents. 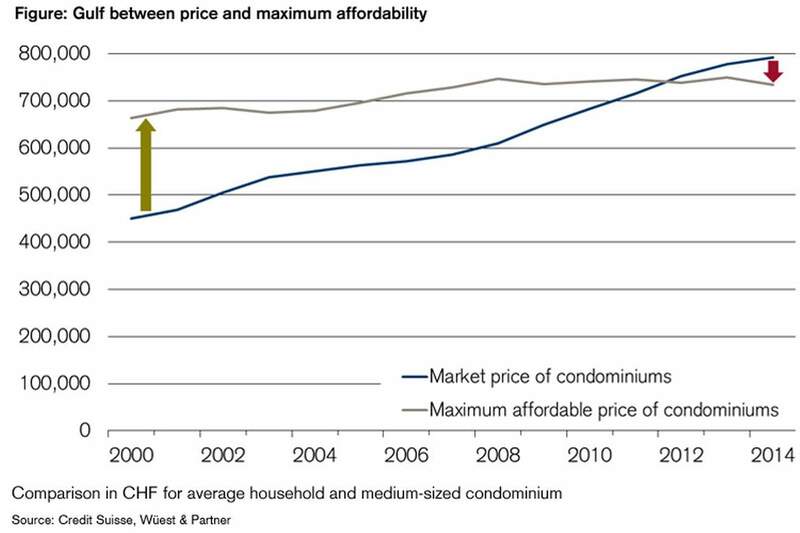 The retail property market in Switzerland is also confronted with major challenges. There are increasing signs that the market is having to pay the price for the surge in investment activity prevailing up until 2011. Although there are currently still some projects in the realization and completion phase, there are virtually no more new projects in the planning phase to be found in Switzerland. This speaks volumes. There is great uncertainty on the part of both investors and tenants about how the market will be able to cope with the forthcoming challenges posed by the growth in online trading. 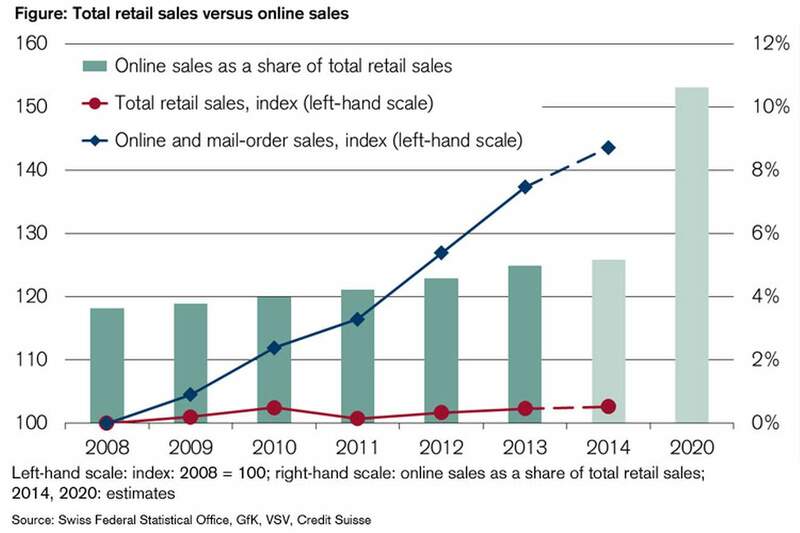 Bricks and mortar retailing still has to find its new role in a digitized omni-channel world (see Figure) – and this in a business environment that has by no means become less challenging with the appreciation of the franc. It therefore comes as no surprise that every fourth retailer in the non-food segment in Switzerland plans to reduce its retail space. There are widespread complaints about a lack of housing despite the fact that vacancy rates for rental apartments are currently at their highest level since 2001. The easing should be increasingly felt in the future as demand has passed its peak and tenants will be affected by the downturn of the labor market. A fall in immigration of just 10 percent (see Figure) will largely secure the occupation of newly built apartments once more in the current year. However, this will no longer be guaranteed in the medium term. It will not be the regions currently recording the greatest immigration momentum that are affected most by a continued decline in immigration but instead rural regions. The main reason for the expected easing is the prevailing strong housing production. Because housing construction is continuing to be pushed in the present negative interest environment, the longer periods on the market and weaker growth of advertised rents currently being observed will remain in place in the near future. They are early signals of a decrease in pressure on rents. However, a fall in rents on a broad front is not yet expected in the next few quarters as the market is only shifting slowly. Without regulatory measures and the dampening effect of repeated warnings of a price bubble, the residential property market would extensively overheat due to the ultra-low mortgage interest rates. High prices and the tightened equity requirements introduced in particular in the summer of 2012 are curbing the demand for residential property (see Figure). This 'cohabitation' of an overheating and slowdown on the real estate market is largely working. However, while the high-price segment continues to suffer, the property boom in the less expensive segments is continuing. Nevertheless, property developers have become cautious. The construction of residential property is at its lowest level since 2001. The demand for owner-occupied property is showing signs of saturation, while residential property as an investment is gaining significance in the negative interest environment, although this is not without its risks. The complete Swiss Issues Real Estate: 2015 Real Estate Market – Structures and Prospects study can be found online in Publication Shop (Market & Trends / Swiss Economy).